The dollar amounts, when put in context, tell a story no Minnesota parent wants to hear: Many Minnesota school districts will face budget shortfalls next year unless the Legislature and Governor provide a 3 percent increase to the funding formula — and address the escalating special education cross-subsidy. 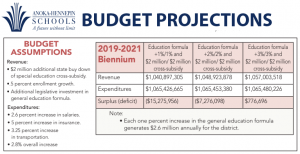 This is what school district budget directors across the state are telling their superintendents as the Minnesota Legislature begins work on the biennial budget. “Years of inadequate state funding have resulted in an ongoing cycle of budget cuts and local levy referendums in our district and in school districts all across Minnesota,” said Mary M. Kreger, superintendent of Rosemount-Apple Valley-Eagan Public Schools. 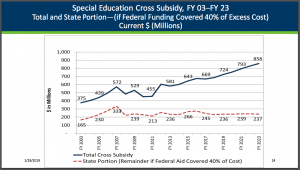 While talk of state and school budget cuts may sound like politics as usual, the number-crunching reality is that years of underfunding general and special education have caught up. If the Minnesota Legislature allocates anything less than a 3 percent increase for the state education formula — and does not address the ballooning special education cross-subsidy, now projected by the MDE School Finance Division to top $793 million by 2021 — many Minnesota school districts will be forced to cut programs and services for all students as early as next year. 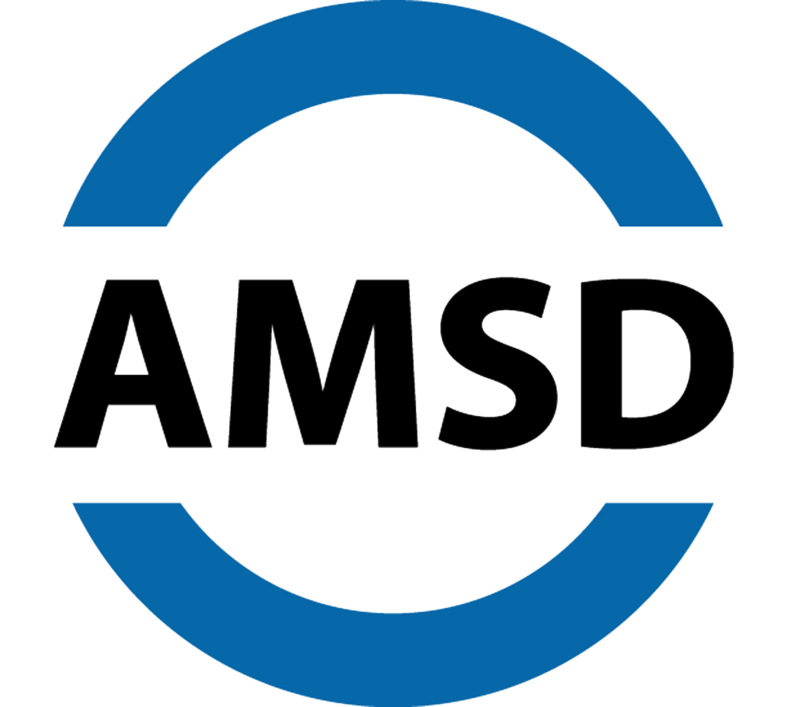 The first real wake-up call to this came in early January — at the AMSD 2019 Legislative Preview. Anoka-Hennepin Schools Superintendent David Law told a group of nearly 200 superintendents, board members and legislators that a 2 percent formula increase, even with a $40 million statewide buydown of the Special Education Cross-Subsidy (giving the AH district $2 million), would leave his district with a $7.2 million deficit in 2019. His report for Anoka-Hennepin was even more grim if the formula increases by only 1 percent: more than $15 million in cuts. These scenarios aren’t just a challenge for the state’s largest district. White Bear Lake, with almost 9,000 students, for example, estimates that a 2 percent formula increase — including a $1.1 million special education cross-subsidy buydown — would still leave it $2.4 million in the red. In Rosemount-Apple Valley-Eagan, the district was already planning $7 million in cuts for the 2019-20 fiscal year.  A formula increase of 2 percent would leave District 196 looking at an additional $3 million in cuts for 2020-21. 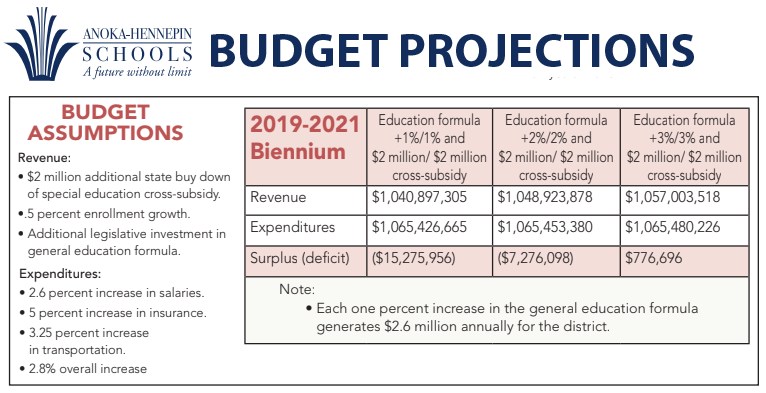 If the state provides only a 1 percent formula increase, District 196 would be forced to cut another $7 million for 2020-21 and an additional $14 million in cuts would be needed in the first year of the following biennium, based on a 1 percent funding assumption for the 2021-22 biennium. A 3 percent increase would stave additional cuts for 2020-21. As districts know all too well: the state is the main revenue stream for school districts. If state funding is inadequate, school districts are forced to turn to local referendums to make up the difference. 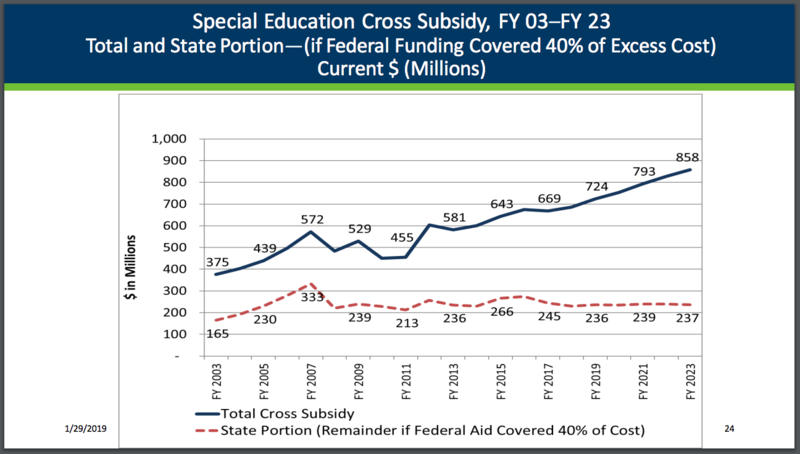 The most recent special education cross-subsidy calculations from the MDE, January 2019. 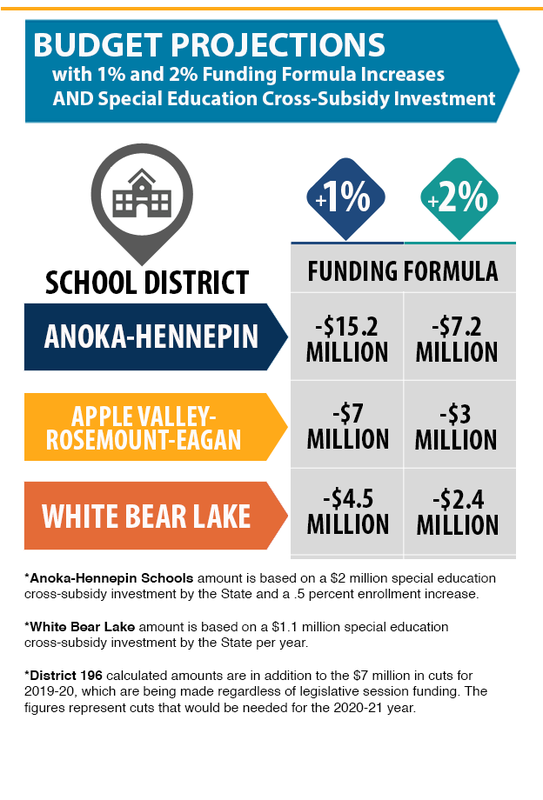 Anoka-Hennepin, for example, will barely break even with a 3 percent increase to the formula. Which means any additional funding— whether for new investments or mandates or simply covering inflationary costs — must come in the form of referendums or significant budget cuts in other areas. “In addition to our ongoing budget challenges, in our current environment, some of our largest cost drivers are out of our control. Special Education, transportation, and health insurance cost increases are being driven by mandates and market forces that outpace inflation,” Law said. “These factors are important to consider for those wanting to invest in and improve education.” To better understand how special education cross-subsidies impact school districts and all students, see our video at www.amsd.org/specialeducation.